India is offering free education to every child until the age of 14. However, as a result of a lack of teaching quality in public schools, children do not even learn the basics. Parents in the villages have often not gone to school themselves. This leads to a situation in which teachers barely come to school, classes are not held and children are hardly learning anything. As a result, many children drop out from school very early in their life. By considering all of the fails and loop-holes in the public schools, we have taken up a number of initiatives to improve the public schools in Northeast India – starting in Assam. There are not many qualified teachers for subjects like Science, Math and English in rural Assam. Typically, public schools don’t have any science materials and it’s most difficult for the children to understand the concepts without any practical experience. Our partner in Assam has come up with an innovative way to bring low-cost science labs to the schools and train the teachers on-the-job. Children have made tremendous improvements by learning in a practical and fun way. We believe that communities are the strongest fighters of their own problems. Most often they are not aware how to tackle their problems and don’t know which rights they actually have. There are official committees which are supposed to supervise the school and make school development requests to the government. Our partners work with the School Management Committees, the parents and mother groups to improve the school management and to hold the government accountable. Children learn most when they enjoy what they do. Unfortunately, education in India is still mainly based on rote learning and quite discipline in the class. Our partners in Assam are using knowledge and activities of reformative pedagogy and came up with better session design, communication practices and improved teaching- and learning materials. Teachers are being trained and supported to make the classrooms livelier and joyful for the children. per month allows us to improve one school. We require a total of 145,000 Euro to work with 150 schools and improve the learning levels of 15,000 students in Assam. 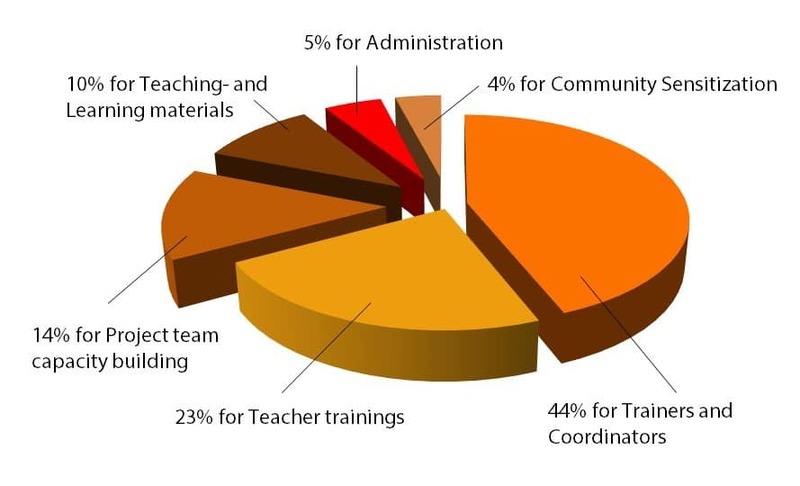 Funds are mainly used for training the teachers and coordinating the work.